As you look at the enclosed photo, we have been serving as missionaries for over 34 years as missionaries now, we think you will be as amazed as we are about the journey God has led and is leading us on. When we moved to Costa Rica, Central America in early January of 1982 we had been married just fourteen months and all we knew was that we felt God had called us to be missionaries. We had very little money, just a handful of people who really believed in us but we had a dream and a desire to serve God as missionaries. In those early years in Costa Rica there were many times WE WERE TEMPTED to give up and just go back to the US and get “normal” jobs. Sometimes it was so hard and so discouraging. Fortunately those discouraging times didn’t last too long. Now when we look back on all these years and all the places we lived and how it was and is to raise our four kids in many different countries, nobody is more amazed than we are. We are on an amazing journey as missionaries and we love it. As we start our 34th year as missionaries, we still absolutely love doing what we do. We write this January 2016 Special Letter to you as we look out the window at the cold winter weather and once again look at our plans for 2016. Every year we look at what we feel God is leading us to do for the coming year as we serve here in Budapest, Hungary. And we are so excited about what God has for us this year, 2016! Our Plans For 2016 – To Help Start Another 15 Churches! The money we invest is enough to help for the first twelve to twenty-four months. By then the Pastor has taught his people to begin to support the new church. We primarily help to start the churches in towns that do not have a church that teaches the gospel. In the past SIXTEEN years we have helped key national leaders to start more than 240 churches. Churches that are now making an impact upon their cities. You have helped us do this! This year we will see at least 15 MORE started. 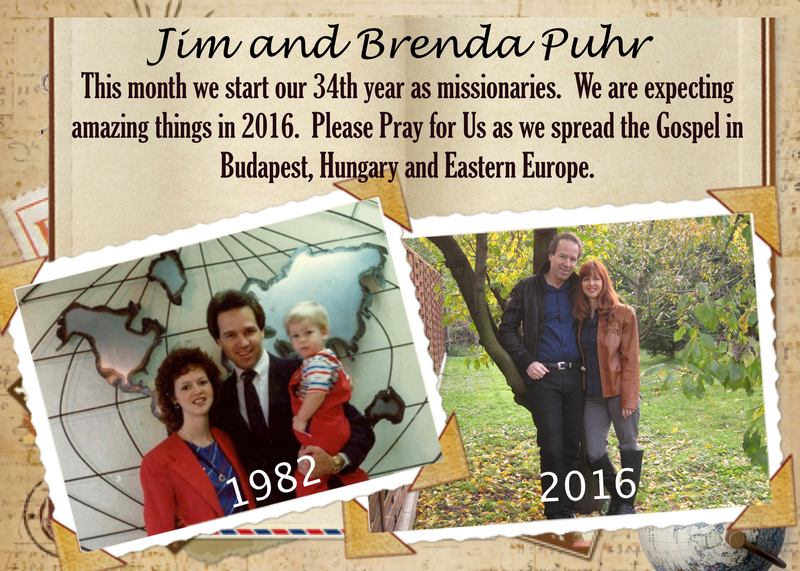 As we begin our 34th year as missionaries, we are amazed that we get to do what we do and absolutely love being missionaries in Hungary. Special Family News . . . This year Alexandra, Audrianna (from West Palm Beach, Florida) and Ryan and Katie, (from Nashville, TN) were able to be with us for Christmas. Nathan and Lori, and Lenora stayed in Orlando with Lori’s parents this year. But we had a wonderful time celebrating our 19th Christmas Season with our daughters Alexandra and Audrianna and Ryan and Katie. Every year we appreciate FAMILY so much more. PS. As you make your giving plans this year, we would ask you to prayerfully consider increasing your giving to this ministry this year. Thank you so much.